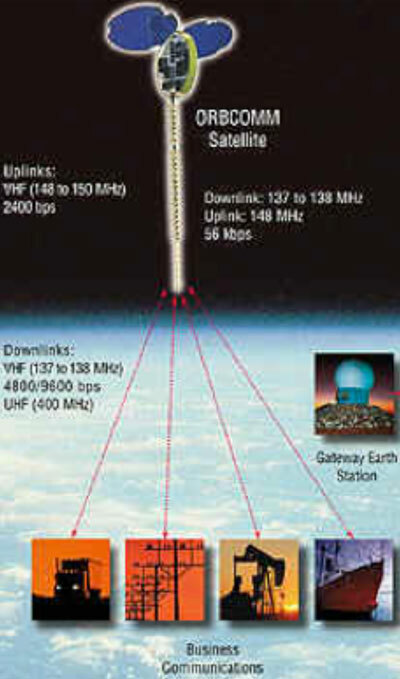 The ORBCOMM Constellation required the launching of multiple satellites in a single launch. The launches were planned on Pegasus and it was anticipated that eight satellites at a time would be launched. Figure 1 shows the eight satellites stacked upon each other ready to be loaded onto the Pegasus launch vehicle. Due to this launch scenario, the structures and overall satellites had to be of low weight and high stiffness in order to launch these into space to have them remain stable. 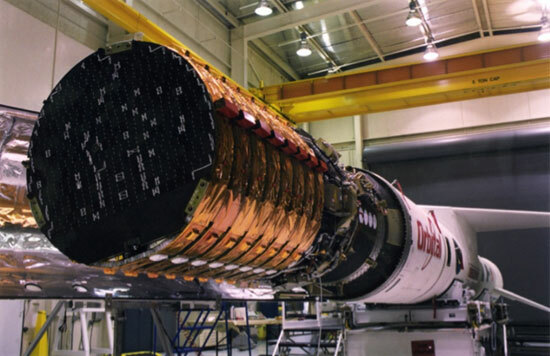 Our people assisted Orbital Sciences Corporation (OSC) on the ORBCOMM project to utilize an advanced material that was a resurrection of Lockalloy. Lockalloy was an aluminum-beryllium alloy produced and patented by Lockheed and marketed under the Lockalloy trade name. Back in the late 1960’s/early 1970’s, this material was utilized for structural applications and was even applied to the SR 71 ventral fin. The advantage that this material provided (62% beryllium/38% aluminum) was that it was easier to fabricate, machine and yield components versus pure beryllium. Due to the market conditions and Lockheed’s desire to sell structure not material, the material never gained enough market share in order to successfully continue. Brush Wellman, in the late 1980’s/early 1990’s, reproduced the material and began marketing it under the trade name AlBeMet. 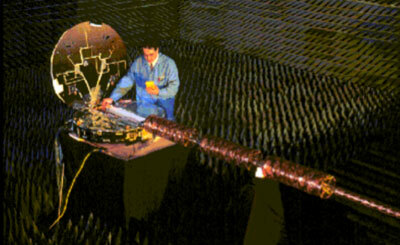 ORBCOMM was one of the very first satellite designs that incorporated this Al-Be alloy. OSC asked Peregrine’s people to assist in the design, fabrication processes and verification means in order to yield a primary structure for their small satellite application. Al-Be was a cost effective form of a high performance, exotic material providing high stiffness, moderate CTE, low density and good strength. Since the material was dormant for approximately 20 years, OSC turned to Peregrine to assist in the fabrication processes and testing methods. As in all structures, materials need to be joined, machined, finished, non-destructive examination (NDE) methods applied and testing performed. Peregrine’s personnel worked on the processes necessary to successfully create the primary structure for ORBCOMM along with some of the secondary structure for that constellation. The ORBCOMM constellation consisted of a primary structure made from AlBeMet, two deployable solar rays and a deployable boom with a structure within the boom being from Al-Be alloy. Our people systematically went about identifying the proper processes needed to create these overall structures, and then performed verification steps in order to validate the mechanical strengths, performance factors and verification tests that would allow the structures for ORBCOMM to be built. A number of processes were reviewed for the joining method; mechanical, brazing, epoxy bonding and welding. Finishes were reviewed as far as chem film, primers and thermal coatings. Due to the parameters established for the design, the processes of brazing and epoxy bonding were chosen for the joining of detailed parts into the structures. Finishes were selected as chem film and a primer. The chem film is a corrosion resistant finish per MIL-DTL-5541. The primer is a bonding preparation primer typically used within the aircraft and spacecraft industry called BR 127. The primer allowed for bond preparation surfaces to be made. In regards to the primer, it is deposited in a thickness of approximately .0002/.0004 inches thick. To epoxy bond to this primed surface, all that is necessary is an IPA wipe to remove any residual contamination and then high strength bond joints can be made to that surface. Peregrine achieved a lap shear result of approximately 4,000psi using a high strength epoxy. The primary structure is shown in Figure 2. 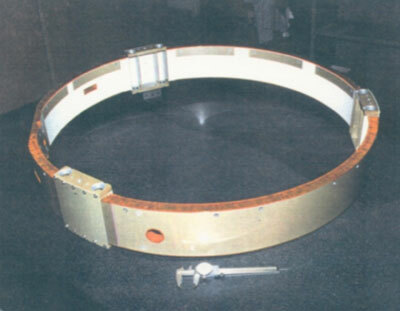 This ring consists of three one inch thick Al-Be sandwich panels epoxy bonded to three separation brackets. These brackets have approximately 0.5 inch thick upper and lower flanges to hold the separation bolts and bearings to provide a stiff load path between the spacecraft structures and the launch vehicle. The satellites were to be launched eight at a time. The separation brackets allowed for the stacking of one upon the other, forming a stiff and continuous beam from the launch vehicle up through the satellites. This produced the effect desired in achieving overall rigidity and being able to provide a stable structure for launch. Additional components were fabricated from Al-Be for the deployable boom and some of the components within the structure. During the fabrication of the detailed parts and the epoxy bonding of the entire assembly, NDE methods were employed to screen out small defects. Typically visual, dimensional and special level dye pen were used to perform that function. Additional inspections were made using ultrasonic inspection around the brazed joints and some of the bond joints. Individually, each satellite structure was tested in static, vibration and thermal vac. Exhaustive testing of the ORBCOMM spacecraft structures was conducted by simulating all flight loads for all critical components including the separation event (shock load). The design was successfully validated.